Need tables in a hurry? Order the 2900 6-foot almond table in a 4 pack here. 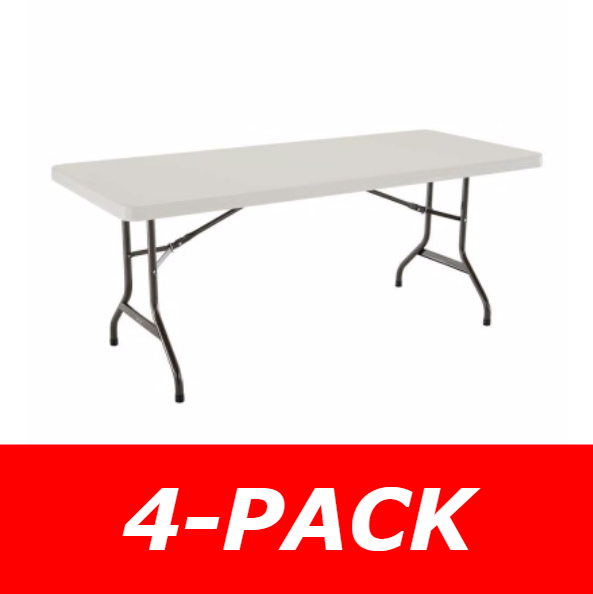 This 4 pack will provide seating for 24 to 32 adults, based on a seating capacity of 6 to 8 people per table. The 42900 model comes with 4 of the 22900 tables in a single package. 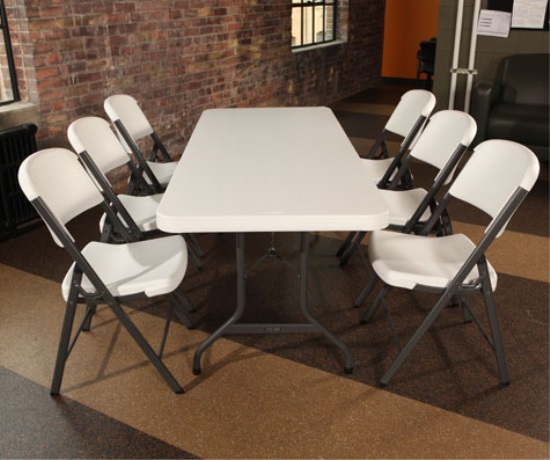 This table has a 6-foot high-density polyethylene table top and a powder-coated steel frame. HPDE plastic is well-suited for both indoor and outdoors use. Inside, the Almond color is a neutral color, matching most color schemes of the room it is in. Outside, HDPE plastic will not fade, crack, or peel like traditional plastics. The sturdy, powder-coated steel frame supports the table top to up to a 2,000-lb. weight capacity of evenly distributed weight. The powder-coating of the frame helps the steel resist rusting. As with the single back of this table, the 42900 tables comes with a 10-year factory warranty from Lifetime Products, providing you many years of use. These tables are all light weight, weighing in at about 34 lbs. each. They also are easily stored. Their folded thickness is a mere 2 inches, which means when all 4 tables are folded down and stacked, they occupy a space of 72 inches x 30 inches x 8 inches. Order your Lifetime tables here. The model 2900 is the exact same table as the model 2901, only a different color. The 2901 Lifetime folding table is a white granite color and the 2900 Lifetime table is almond. Almond is supposed to be a shade of tan, but has more of a gray tint to it. Model 2900 matches the color of models 2984 and 2803, among other almond models. 22900 Lifetime Tables. You can order this table in singles here. 2900 Lifetime Tables. 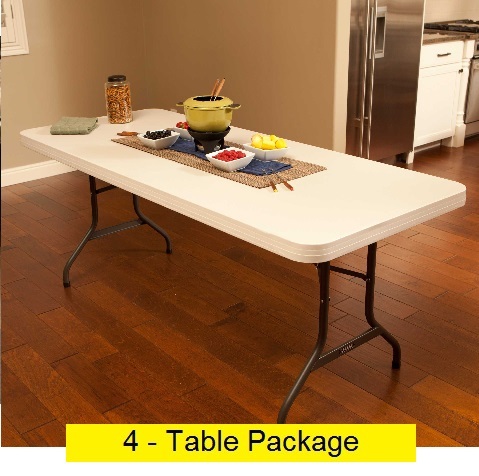 Save even more money per table by ordering this table as a 22-pack. 42803 Lifetime Folding Chairs. This is the matching chair for the 42900 sold as a 4 pack. Dimensions: 72 inches L x 30 inches W.
Table top height unfolded: 29 inches. Material of construction: high density-polyethylene (HDPE) plastic. Color: almond. Almond is a very light color, sometimes called a light gray or a light tan. HDPE plastic will not fade, crack, or peel in the sunlight like traditional plastics. Easily cleaned. Table top cleans up typically needing nothing more than soap and water. For tougher stains, a mild abrasive can be used. Seats 6 to 8 people. 6 foot tables can typically seat 3 adults on each long side of the table. Depending on the use, an additional 2 adults can be seated at this table with 1 on each of the short ends of the table. Dimensions: 1 inch diameter tubing. Frame material of construction: powder-coated steel. Made with 18 gage steel. Powder coating on steel helps the metal resist rusting, making the table good for both indoor and outdoor use. Comes with a 10-year factory warranty from Lifetime Products for customers in the United States and Canada. Table top weight capacity: 2,000 lbs. of evenly distributed weight. This table exceeds ANSI/BIFMA standards. Table weight: about 34 lbs. Shipping dimension: 72.5 inches L x 30.5 inches W x 14 inches H.
Shipping weight: about 198 lbs. Feet on legs have mar-proof caps. When unfolded, the leg has solid steel locks to maintain stability. Table top is supported by a steel beam along both long edges of the table. Cross brace and central support brace also strengthen the stability of the table top. These are the best tables we have found to hold up to the rigors of church fellowship meals and activities. They are well braced to hold heavy loads and yet light enough that they can be carried by one person. Lifetime continues to be the easy choice for our church: they have proven exceptionally durable and lightweight -- handling everything from fine dining events (weddings) to the [hard use by] children. I purchased four of the six-foot-folding types over three years ago for my daughter's wedding reception. One word: Incredible! They were more than ample to support the wedding presents and catered food. A couple folks decided to use one as a bench as the evening progressed. No problem. It easily supported the weight. Thank you! I looked all over for tables like these - they are a great value. They can hold a large network printer or work as a worktable in a crunch. I could not find them at local warehouse stores for anywhere near this price. Q: What does a 4-pack mean? / What is the difference between the 22900 and the 42900? 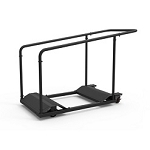 A: The 42900 is a package of 4 of the 22900 folding tables prepackaged together. There is no difference between the 22900 table and the tables in the 42900 package. Q: I received my 2900 table, but it looks white. 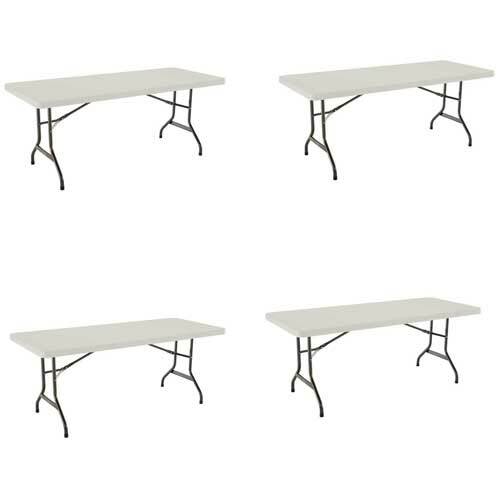 Did you send the wrong table? A: The almond color of this folding table is a very light color. It is easily, and frequently, mistaken for white on first glance. The easiest way to verify the color you received if to take a white piece of printer paper and lay it on the table top. The almond color will become obvious with the white paper on it. Q: Is this table going to hold up? A: This table is more than sufficient for most any banquet needs. With a 2,000-lb. weight capacity, you will be highly unlikely to ever exceed that weight. If you are wanting some additional weight capacity and assurance, you can view Lifetime's 80126 Professional Grade Table. Q: Will I need to be home for the delivery? Q: What colors does the 42900 table come in? A: This table comes in Almond (model 42900) and White Granite (model 42901). Most organizations order White Granite, but Almond does hide dirt better. Q: How many people can sit at this table? A: Generally, a 6-foot table can seat 3 people on each of the long sides of the table and, depending on the activity the table being used for, 1 additional person on each of the short ends of the table for a total of 8. Shipping! Shipments for this 4 pack generally leave the warehouse within 2 business days of ordering. The item ships from the warehouse in Clearfield, Utah via an ltl freight carrier for a curbside delivery. A curbside delivery requires the customer to be home to sign for the shipment and to move the product where needed on the delivery property. For residential deliveries, the delivery company will schedule an appointment for delivery with the customer before attempting to deliver. The customer can also contact the freight company to schedule this appointment. Local pickup in Clearfield Utah if you wish to avoid shipping charges. Dimensions: 72" x 48" x 10"